Kirkby Moorside (or Kirkbymoorside) had a workhouse from 1773 which accommodated twenty inmates. It was located on Tinley Garth, in a building which still stands, now converted to private residential use. Former Kirkby Moorside parish workhouse. County of York, North Riding: Bransdale, West side; Great Edstone; Little Edstone; Fadmore; Farndale, East side; Farndale, Lower Quarter; Farndale, West side; Gillamore; Hutton-le-Hole; Kirkby Moorside (2); Muscoates; Nawton; North Holme; Nunnington; Skiplaw; Welburn; Wombleton. Later Additions (all from c.1849): Appleton-le-Moors, East Ness, West Ness, Normanby, Salton, Thornton Riseborough. The population falling within the union at the 1841 census had been 5,091 with parishes and townships ranging in size from Little Edstone (population 15) to Kirkby Moorside itself (1,905). The average annual poor-rate expenditure for the period 1846-8 had been £1,200 or 4s.9d. per head of the population. A new Kirkby Moorside Union workhouse was erected in 1850 at a cost of £1,350 to accommodate 70 inmates. The building, at a site on Gillamoor road in Kirkby Moorside, was designed by John and William Atkinson who were also the architects of many other Yorkshire workhouses including those at Bedale, Beverley, Easingwold, Guisborough, Goole, Helmsley, Howden, Pateley Bridge, Pocklington, Skirlaugh, Wetherby and York. Their design for Kirkby Moorside had a two storey main block facing to the south-east, with single storey blocks to each side. A small building to the north may have been a small infirmary. The workhouse location and layout are shown on the 1910 map below. Kirkby Moorside Union workhouse site, 1910. 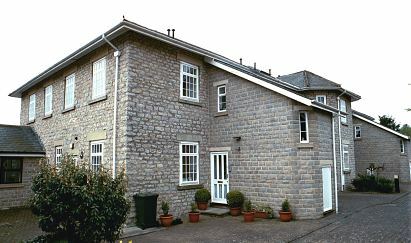 Kirkby Moorside main block from the south, 2001. Kirkby Moorside from the north-east, 2001. After 1930, the running of the eastablishment was taken over the North Riding County Council who continued its operation in the guise of a Public Assistance Institution. In 1933, the infirmary block (now demolished) was briefly used as a youth hostel but later that year was taken back for use by the Institution. In the 1970s, the former workhouse was used to accommodate Vietnamese refugees. The building has now been adapted for residential use. North Yorkshire County Record Office, Malpas Road, Northallerton DL7 8TB. Main holdings: Union minute books (1848-99); Assessment committee minutes (1896-1927; Ledgers (1845-1930); Treasurers' accounts (1914-30); Receipt and expenditure books (1917-34); Day books (1897-32); Firewood account books (1913-34); Relief lists (1914-26); Admission and discharge books (1911-32); Lists of lunatic paupers (1890-1930); Master's report books (1920-40); Inventories (1908-31); Returns of birth registrations (1876-98). Helmsley and Kirkbymoorside Workhouses by Dr P Hastings (1996, Ripon Museum Trust leaflet).